Find applications where electrical integrity of the cable has to remain intact for at least three hours, so as toactivate and maintain crucial functions such as fire fighting, public announcements, smoke extraction systems, sprinklers, emergency lighting, evacuation path lighting systems etc. 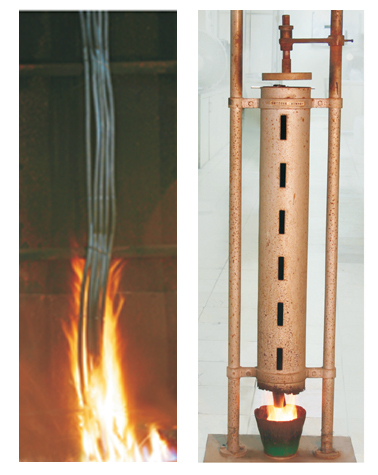 The areas for Fire resistant cable applications include places where large number of people congregate for short or limited period of time such as shopping malls, cinema theaters, educational institutions, airport terminals, mass transit systems (metro rail networks), high rise office buildings etc. FR cables also find use in power generation facilities, petrochemical complexes, nuclear power facilities, mines etc. for phased shut down of the plant and to keep critical functions like communication, rescue and evacuation systems functional during a fire. IEC:60331 tested for 950°C for 3 hrs.